These hand held wax torches can be used as processional wax torches or traditional garden wax candles and are excellent value for money. The current wax torch we have in stock is our new improved torch. Designed specifically for us this torch is made with a black wax cloth design and a fixed wooden handle making it safer to hold in processions. Boxed in 75’s to make handling easier than ever. 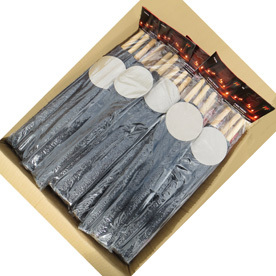 We sell a lot of these for garden parties in the summer, for barbeques, for lighting outdoor areas at weddings and for the Guy Fawkes season. They are also hugely popular all year round for processions. They are for outdoor use only. New style - superior quality torch with fixed wooden handle. Excellent for processions and for lighting walkways etc.